Saiseisakaba in Shinjuku is one of my favorite standing bars in Tokyo. Located in Shinjuku Sanchome it is close to Isetan department store. We asked the server for something unusual to start off with. He suggested brain sashimi. We were game, but when it arrived, my husband Shinji (who is a fishmonger and is accustomed to eating many weird things) was not willing to take the first bite. I dug in and actually enjoyed it, similar in texture to shirako (fish sperm sacs). Moving onto something cooked we had gyutan (cow tongue) that is simmered for a long time until tender, one of my favorite dishes at Saiseisakaba. This interior shot overlooking the kitchen shows the sumi (charcoal) grill. Saiseisakaba also offers a variety of different offal grilled. These foods go with beer, sake, or shochu. 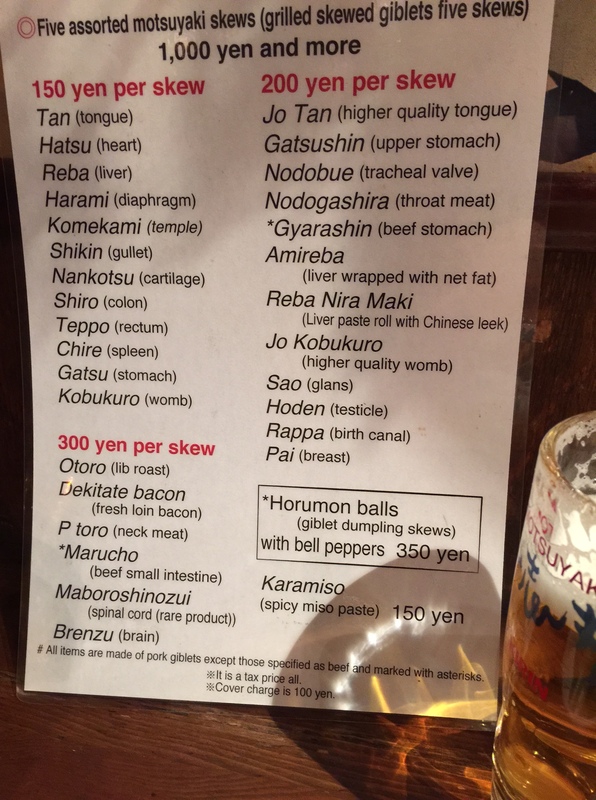 A friend went recently and sent me the new menu in English. Photo credit to Stephen McCready. Arigato Stephen! Near the Asakusa temple district is Kappabashi, an area where chefs and restaurateurs come to buy anything they need to set up shop. Open to the general public, it is a great destination for anyone who likes to cook at home. It is an easy area to navigate as most of the shops line a major street. There are several pottery shops, but one of my favorite is Dengama, just next to the police box (koban). The two floors of the shop offer everything from teapots, rice bowls, chopstick rests (hashioki), and much more. There is a shipping service, often next day. The shop is oven seven days a week.